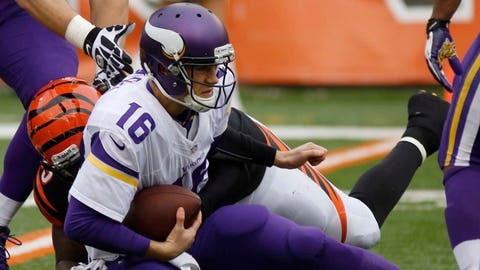 Quarterback Matt Cassel finished with three interceptions and was sacked four times. 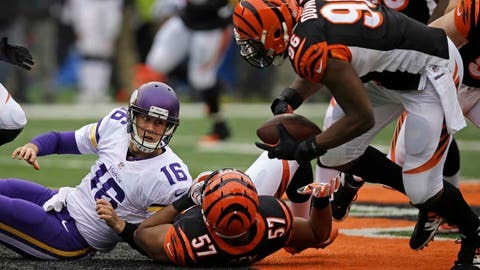 The Minnesota Vikings’ disappointing season continued with Sunday’s 42-14 loss at Cincinnati. The loss drops Minnesota to 4-10-1 this season and a winless record on the road (0-7-1). The Vikings’ playoff hopes have been long gone, but they were looking toward another December of momentum. Minnesota wraps up its season next week at home against the Detroit Lions in the final game to be played in the Metrodome. With Matt Cassel at quarterback, Minnesota had seemingly found a spark in the passing game to complement the running game. Cassel had passed for 890 yards, five touchdowns and two interceptions the past three weeks and the Vikings had won two of the three games. Greg Jennings was having a big impact and Cordarrelle Patterson’s development was taking another step . . . until Sunday. Cassel missed several receivers and his passes often floated. He was not sharp in going 5-of-14 passing for 52 yards in the first half. The one positive — really all game for the passing attack — was a 36-yard touchdown to Jarius Wright. Turnovers by Cassel helped Cincinnati put the game out of reach early. Cassel threw three interceptions and was stripped on a sack for a fumble, accounting for all four of Minnesota’s turnovers. He finished 13 of 27 for 114 yards passing and was sacked four times. Pressured often, he also scrambled three times and didn’t seem as comfortable in the pocket as a week earlier. The Vikings were 0 of 9 on third downs, unable to sustain any drives and keep the ball out of the hands of Bengals quarterback Andy Dalton. Minnesota trailed time of possession 39 minutes, 32 seconds to 20:28. Hard to believe, but the Vikings ran the ball with some success against Cincinnati’s fifth-ranked run defense. Minnesota finished with 115 yards rushing on 17 runs for a 6.8-yard average. But the Vikings only ran the ball four times in the second half. Adrian Peterson had an 11-yard run on the Vikings’ first play of the second half. The only other rushes in the second half were a 35-yard touchdown run by Patterson and two scrambles by Cassel. Patterson made his biggest impact as a runner on Sunday. He led all ball carries with 54 yards rushing on three carries. His 35-yard touchdown came on a toss from Cassel in which he got to the outside of the defense. Peterson had running room at times, but clearly didn’t have the same explosiveness or decisiveness everyone is used to seeing from him. He finished with 11 carries for 45 yards. His 11-yarder was his only carry of the second half. He had 10 carries for 34 yards in the first half. Once the game was out of hand, Peterson was rested because of his injured foot and groin. Sunday’s game was decided in the air. Facing a big deficit, Cassel and the Vikings abandoned the run and couldn’t get anything going with the passing game. On the other side, Dalton had his way with Minnesota’s defense. One of the toughest quarterbacks to sack, Dalton was hardly pressured and connected on 27-of-38 passes for 366 yards and four touchdowns. He didn’t have a turnover and was sacked twice, both coming on one possession late in the game once the game was out of reach. The Vikings were playing without rookie cornerback Xavier Rhodes, who has turned into the team’s top cover cornerback. They lost middle linebacker Audie Cole, who had excelled in coverage, early in the game. Shaun Prater — starting for Rhodes — missed time with an injury, as did Chris Cook, who returned after missing last week. When Cook was in the game, he was targeted often by Dalton. A.J. Green had seven catches for 97 yards and scored both of his touchdowns against Cook in coverage. Minnesota allowed more than 40 points for the third time this season and more than 400 yards of offense for the 10th time in 15 games. The numbers will look good for the Vikings run defense, but they wouldn’t matter. The Bengals ran 37 times for just 81 yards, a 2.2-yard average. BenJarvus Green-Ellis had 12 carries for 24 yards and Giovani Bernard had 13 carries for 20 yards. Bernard did have a highlight 41-yard catch-and-run on a short reception in which he weaved through the middle of Minnesota’s defense. But Cincinnati didn’t need to run because it was unhindered in the passing game. When Dalton needed a play, he usually got it, with eight different receivers catching a pass. Before coming up short on their last three chances, the Bengals were 8 of 11 on third-down attempts through more than three quarters of play. Cincinnati was willing to kick off to Patterson. He made them pay, but not with a touchdown. Patterson had four returns for a 35.8-yard average and is on the verge of leading the league in kickoff-return average this season. His long Sunday was a 48-yarder and he constantly gave Minnesota favorable field position. Punt returner Marcus Sherels took advantage of his one chance, going right up the middle for a 22-yard return. Other than Patterson, the special teams didn’t really factor into Sunday’s game. Kicker Blair Walsh connected on two extra-point attempts and didn’t get the chance to attempt a field goal. He had two touchbacks on three kickoffs. Punter Jeff Locke averaged 39.4 gross yards per punt and 34.0 net yards per punt, continuing an inconsistent season. Bengals’ returner Brandon Tate had a 21-yard punt return. Where and when it counted — early in the game, in the air and turnovers — the Vikings failed. The moderate success in some areas was overwhelmed by the failures in others. Minnesota was winless on the road and facing the league’s best home team in Cincinnati. The Bengals are undefeated at home and have now scored 40 points or more in four straight home games. The Vikings didn’t have the same incentive as Cincinnati — who is fighting to win the NFC North and get a home playoff game — and it certainly showed. The preparation and competitiveness Minnesota had shown in recent weeks was gone, vanquished early by the Bengals and their home field. Another big letdown at the end of a bad season only adds to the questions about the team’s coaching staff and who might be safe in a big offseason.